Since I have learned to make steamed rose bun, I hooked on steamed bun styling, especially flowers and animals. In addition to attending classes and teachers on the internet, I use to create some simple lovely small steamed buns, pumpkin sunflower bun is one of my triumph. For children, I will only color my steamed bun with natural food coloring. As fresh pumpkin brings pretty bright orange, I have not found another natural substitute. Even the pumpkin powder which can only bring light yellow. Nutritious pumpkin is tasted sweet, my kids love to eat pumpkin steamed bun. Their smiling face is mother’s largest encourage! The moisture of mashed pumpkin is different, depends on the variety, freshness, time of refrigerator preservation, the production process of mashed pumpkin, It is suggested to cover pumpkin cubes with a dish, tin foil or microwave oven cling wrap while while steaming, in order to avoid excess moisture permeating pumpkin cubes. After steaming pumpkin, if there is unnecessary moisture in the vessel, please throw it away. The mashed pumpkin must seal and keep in refrigerator. Neither a drop of water is added in the following recipe, dough humidity is linked to mashed pumpkin, flour, even indoor humidity. If the dough is found dry or wet while mixing, please add water or flour bit by bit until it becomes “three-clean conditions“ (i.e. clean mixing bowl, clean hands and clean dough surface). There are many tricks have been written in the recipe, please read before hands-on so. Peel and cut pumpkin, steam until cooked, mash with fork. It can be stored in the refrigerator for one week. Water level of different brands flour is slightly different, it would affect the buns directly. This is the flour I used; if you use other brands, please adjust water level. This is the instant yeast I used for steamed bun. 1. Put all the ingredients in the bowl, (put salt later because salt would suppress yeast fermented, never let salt touches yeast directly. Suggest to make a small hole in the flour for placing salt and fill that hole with flour.) Mix all ingredients into a dough with a long spoon and knead it on tabletop. If there is a kitchen machine or bread machine can help, just simply put all of the material into mixing bowl or bread pan (put salt later) and blend for 15 minutes. Whether kneading by hand or machine, it is required to knead the dough to be “three-clean conditions“ (i.e. clean mixing bowl, clean hands and clean dough surface). 2. Deflate dough: Knead dough to be long, fold one-third from left to middle and fold the another one-third to middle as well. Knead until dough to be long again. Repeat three times. Knead dough to be long. Fold one-third of two sides. Knead to be long again, repeat for 3 times. Dough is more smooth after deflation. 3. 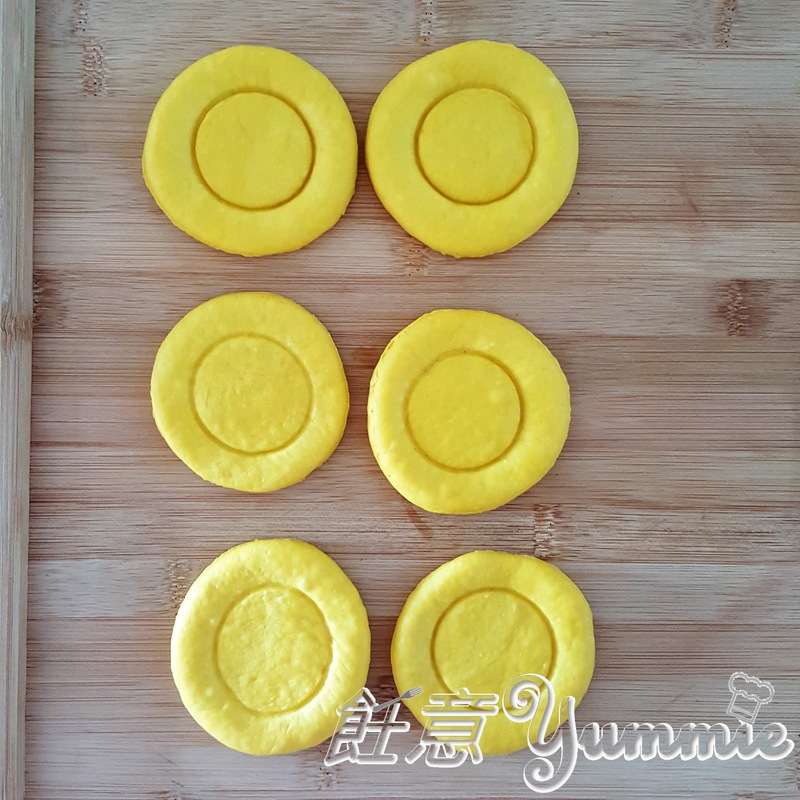 Roll the dough as 3 mm thick, mould the dough into 6 round portions by applying approximately 8.5 cm diameter mold or cup. Rolling pin with 2 plastic circles or rubber brands at the ends can help to fix the dough thickness. 麵餅周邊如有壓模不平的痕跡，需以手指輕拍整平。Mould cup on dough, press clockwise and anti-clockwise, ensure the round part can separate from dough easily. If the edge is not smooth, please pat it gently. Only 4 round parts can be molded in one time. Roll the rest of dough again, mould 2 more round portions. The rest of dough can be used to prepare stamen of sunflower. Each round part is about 33 grams weight . 4. Store the unused dough in a box with lid in order to avoid becoming dry. 5. Mix cocoa powder into the rest of dough thoroughly, the well-prepared brown dough can keep in a box with lid. Roll dough and put cocoa powder in the middle. Spray water on dough or apply water on the dough around cocoa power. Knead for a while, it’s found that even knead thoroughly, the brown colour isn’t enough. At this moment, please repeat the above procedure, knead with more cocoa powder. Knead until the brown dough is smooth and its colour is even. Put the dough in a box with lid. 6. Take out the yellow parts for moulding. Mould a 4.5 cm diameter with a little cup in the middle of round parts. There are two methods to make petals. The first method is to cut a number of bars in peripheral. The second method: Cut and pitch immediately. Pinch 3 bars into a petal. Bars of the left one are thinner, it can make more petals, more prettier. Put the flower bases on baking paper. 7. Turn brown dough into stamen, dip water in the middle of flower base, press gently. 同樣用4.5厘米的杯子印6個圓麵餅。Roll brown dough as 3 mm thick. Mould 6 round parts by 4.5 cm diameter cup. Crimp and form checkered patter by spatula or small knife. Apply few drops of water in the middle of yellow flower base, put on the stamen, press slightly around the stamen. 8. Put 6 sunflowers into bamboo steamer. 9. Boil water until 45 degree Celsius, turn off the heat. Put the bamboo steam on the wok for 20 minutes for fermentation. When water is around 45 degree Celsius, some little bubbles would be found in the bottom of work without smoke. If testing water by hand, you would feel warm but not hot. Turn off the heat, cover the bamboo steamer for 20 minutes for fermentation. 10. Turn on to medium heat. When it is boiling (Put hands above the steam lid to feel it, MUST NOT open steamer lid or move the steamer), steam 20 minutes. Afterwards, turn off the heat, don’t open the lid. Wait for 5 minutes, open a slit for 30 seconds, open the steamer slowly at last. The purpose is to allow bun cooling down slowly, in order to avoid wrinkle in the surface as hot steam bun meets cool air in a sudden. Open a slit for 30 seconds after 5 minutes resting. 11. Take away the baking paper, move the sunflower steam buns on cooling rack. They are ready to serve upon cooling down. Steamed bun will be inflated, darker in colour and shiny. Cooling on rack can emit humidity during steaming. A basket of sunflowers, fertility and sunny! A rough pine cone is made by excess brown dough.